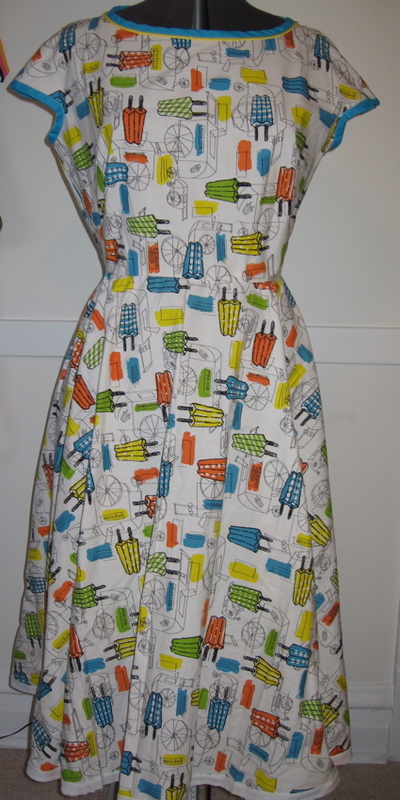 Do any of y'all remember the popsicle fabric I bought off eBay, way back in December 2005? 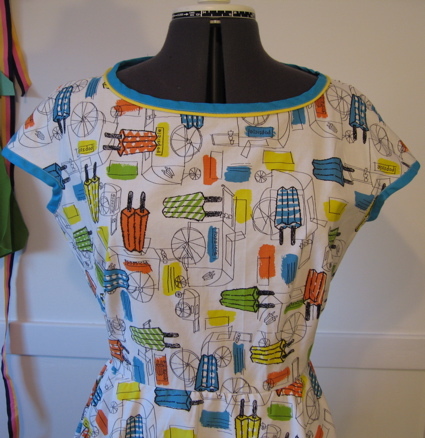 Well, I hardly remembered it either, until I was in the sewing room this past weekend looking for something else, and then I remembered that last fall I had started to make a dress out of it. I say "started", because, in a true triumph of hope over experience, I put it together in September. This happens to me a lot. It's early September, it's still in the high seventies, degree-wise, and I think, "Oh, sure, I'll make one last summer dress and wear it for a few weeks before I break out the sweaters." No. I usually get it right to this stage (the dress above is missing the side zipper and the hem isn't finished) and then, BOOM! The temperature drops to 50, I have absolutely no interest in popsicles, either to eat or to wear, and the poor dress has to live in purgatory all winter long. love the fabric and love the dress!especially the trimming around the top. I loved all about this dress… I think I simply fell in love with this one… Got to get one like this! If you still own this dress. I would love to own it! Please comment!